ATLANTIC CITY, N.J. — Hours after a new Miss America was crowned, the Miss America Organization released a report Monday denying the outgoing one had been bullied by pageant leaders including chairwoman Gretchen Carlson. The lawyer for former Miss America Cara Mund called the report, commissioned by the Miss America Organization, "dishonest" and "a complete whitewash." Mund was not interviewed for the report. 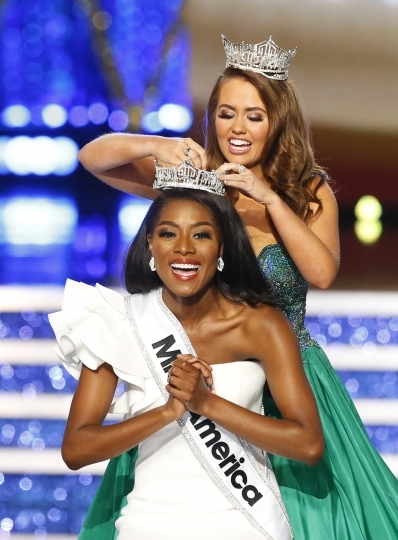 She had offered to meet with an investigator working on the report after the next Miss America was crowned Sunday, but pageant officials insisted it had to happen before then. The report was intended to put an end to a turbulent year in which the former leaders of the Miss America Organization were forced from office by a misogynistic email scandal, new female leaders took over and dropped the swimsuit competition, state pageant officials revolted against the new leadership, and Mund herself took the extraordinary step of saying Carlson and CEO Regina Hopper bullied her. But it does not appear the issue is going away anytime soon. "None of the information gathered indicates that she was treated in a way which would be considered inappropriate either in a typical business setting or in this particular work context," read the report, which was carried out by a third party employment practices consulting firm hired by the Miss America Organization. Roger Haber, Mund's attorney, rejected the report. "This document is not only dishonest, but a complete whitewash," he said. "It contains a series of unsupported conclusions, without any factual basis. It was what we expected when the MAO decided to proceed without speaking with Miss America 2018 Cara Mund, the person who raised the allegations in the first place." In a letter sent to former Miss Americas in August, Mund broke her silence about how she feels she was treated under Carlson and Hopper's leadership. "Let me be blunt: I strongly believe that my voice is not heard nor wanted by our current leadership; nor do they have any interest in knowing who I am and how my experiences relate to positioning the organization for the future," Mund wrote. The report also found no evidence to support claims that Mund was silenced or retaliated against for raising concerns about her treatment. During Sunday night's nationally televised pageant finale, Mund only appeared at the very end before Miss New York Nia Imani Franklin was crowned as her successor. Mund was not allowed to speak live; instead a 30-second taped segment of her speaking was broadcast. Franklin was asked shortly after winning the crown what needs to happen to move the organization past its current difficulties. "I don't want to sound cocky, but I think you're looking at her," Franklin told reporters. "I think this is going to be a wonderful year. It is about the leadership and mentorship and sisterhood that you find in this program, and if we focus on those positives, that's what's going to keep this organization up and running." Sunday night's competition was the first without a swimsuit competition in the pageant's 98-year history. Franklin said the changes were a welcome modernization. "I've already seen so many young women reaching out to me personally as Miss New York asking how they can get involved because I think they feel more empowered that they don't have to do things such as walk in a swimsuit for a scholarship. And I'm happy that I didn't have to do so to win this title tonight because I'm more than just that," Franklin said. "And all these women onstage are more than just that." She wrote her first song at age 5. It went "Love, love, love, love, is the only thing that matters to me, hey, hey, hey, hey, hey." At the prompting of an Associated Press reporter, she sang the song at her post-victory press conference as audience members snapped their fingers. The fourth-runner up was Miss Massachusetts Gabriela Taveras; third runner-up was Miss Florida Taylor Tyson; second runner-up was Miss Louisiana Holli' Conway, and the first runner-up was Miss Connecticut Bridget Oei.